Blaze hunting grounds are full with prey and predators.Here young Shines who want to be Lights can come here and train their skills.Grass,herbs and prey the best place for hunt.Shines can come here hunt with two or one Light watching them and helpng them. Blake arrives in hunting grounds starving.He looks around for elk herds.Spots one elk herd and stalks to it jumps and stars chasing the elk .Runs and jumps on the elk bites the neck crashing it and holds on.It doen't take long the elk gets tired and falls dawn Blake bite harder killing it.He stars to eat, when is full he leaves for the pack.The goes to the pack den. Karsy find the carcass and starts to eat.She looks around seeing no one around.She foes to Sun lake feeling little bit thirsty. Bolt arrives in the hunting grounds.It was beautif but he was curiously searching for prey.He found an elk herd in far distance.With his massive body he could take dawn a adult female elk.Bolt stalked closely to them.Bolt jumped in attack and started the chase.His legs where strong and could hold on the chase soon the elk slowed.Bolt bited the elk's legs and then the elk lost ballance.He went for the neck, crashing it.The elk was soon dead.Bolt ate a little part of it and left the mre meat for the pack.Bolt's day job was sucessful but he needs a group of elite hunters for the job.The energy he lost in the chase and kill was big, he won't lose that much energy is someone helps him.Bolt grabe the elk by it's legs and started to push it to the den.Bolt thought "It will be easyer if someone helped me" tired, he will talk with Karsy for this later now the carcass have to be to the den. "This is the hunting ground, oh i'm starving how about a hunt for flying we need lots of energy" said Karsy.Looks around for any prey.The flying tired her a lot.She need for for all she turned to Bolt.She knew he was a hunter.Karsy rolled eyes around and spoted elk herds.Four wolves could take dawn and old female elk herd.Karsy hood wings she doesn't need them for the hunt.Karsy set dawn resting "We could rest now, when youre all ready tell me." she said loking at the elk herds. The male darted to Karsy, panting and huffing. He accidently got his paw stuck behind a rock, an went flying in the air. Pheonix tumbled onto the floor, rolling on his back. "Slow down.." He panted, his fur all puffed up from all the running. He twitched his nose as he smelled a new prey. Elk. Pheonix has no talent for hunting and would tire out in just a minute. 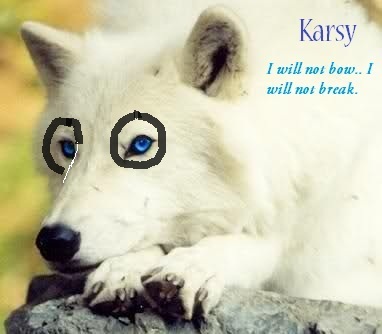 The ginger wolf glanced at Karsy. He stared at the elk herd in the distance, and licked his jaws. Pheonix looked at Karsy. "We have 4 or 5 wolves so we could go elk hunting" He grinned, then flapped his fire wings in excitement. "Say when you all ready and we could start the hunt" said Karsy.She was watching the elk herds around.Then herd her stomach warning.Karsy tryed to hide the noice coming from her stomach.Karsy focused at one old female elk herd. "Over there" she pointed the old female elk herd. "We won't lose a lot of energy if we hunt this elk. "Karsy was excited when she eat she could train flying again. Bolt arrived in the hunting grounds.He looked the way Karsy was pointing.And saw and old female elk herd.At least he won't hunt alone, he looked to Pheonix,Karsy and Cat. "I agree when you guys ready" he said.Bolt was watching elk herds around eating grass. Cat realizes she got distracted and everyone else is gone. She runs to the hunting grounds overhearing everyone talking about hunting. She listens to her stomach growl. "It's the first group hunt in this pack" she whispers to the group. "Let's make it a good one, my mouth is watering." Karsy noded.She lowered body stalking as close as can to the elk herd.The elk herd was away from the other.Karsy was in seven metres from the elk.She jumped starting the hunt.Karsy was chasing the elk and making it tired and week so others can join the hunt.She was biting back legs of the elk making it slower.Headed the elk to the other pack members. Bolt reaction was fast he jumped on the elk biting it's neck.He slowered dawn the elk.Ohter need to take dawn the elk.He was using his body to take it dawn.But can't other have to help.Bolt was still holding the elk's neck. The male raced forward to the elk, and threw himself off the ground. He landed perfectly beside the elk. Pheonix snapped his jaws on the elks thigh, and digged his fangs deeper into the flesh. The elk stumbled a bit. He let go as the force was too strong for him. Pheonix glanced at Cat and Karsy, and yelled, "We need some help here!." Then the male proceeded to chase aftter the elk. 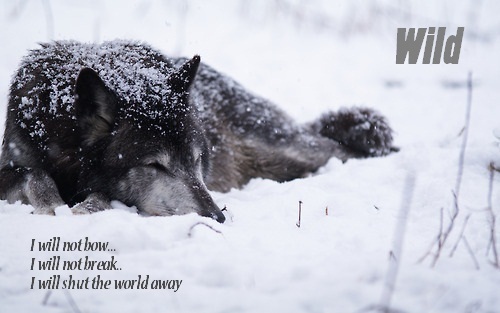 The wolf slowed down and finally halted, panting hard. Hunting is hard. Fighting is much better. Pheonix darted toward the elk again, not giving up. Karsy jumped on the elk, it was like she was riding it.She looked at Cat for help.The she opened wings making self heavy and the elk slowed dawn and stped.The female locked jaws at it's neck.Karsy was stronmgly holding it. "Come on all bite it's neck hard i can't do it alone" she said holding the elk strong as can.She felt that the elk is getting tired.Karsy jumped on it's back and the elk falled dawn.Her jaws were deep in the elk flesh. Cat is the last one to get to the elk. She runs along side it and bites the neck like the others. She could taste it's flesh, which just made her try harder. She shook her head a little, tearing off a chunk. The elk fell down. "Is it dead yet?" She asked the group, panting. Pheonix darted to the half-dead elk, and touched it. "I think it's dead now" He remarked, then poked the elk. The elk lied on the ground as still as a rock, its blank eyes staring into the distance. He clamped his jaws around the elks neck, then picked it up. "Should we bring this back to camp?" Pheonix asked the others. "Great job all" Karsy said proud. "It's to heavy to take it to the den we will eat it now if there is a piece we will give it to Blake and the pup" she said.Karsy lowered head to the elk and started eating.Hear fangs dig into the elks flesh."Umm... common all eat." she said with blood on her muzzle. Bolt starts eating.This hunt was easyer than his. "Yummy" he said while was diging into the elks flesh.He was if the group will leave some for Blake and the pup he didn't want to hunt more because of tired. Pheonix hesitated for a moment, then walked toward the elk. He sniffed it, then pierced his fangs into the flesh. The male felt the blood trickle down his mouth. He thrusted his head, and teared a portion of the elk away. Pheonix chewed on the thick flesh while pulling it with his claws. "Pretty tasty" He grinned. Karsy eats up fastly.Then she trains flying.This time she dones it flys two minutes but flys.Karsy tries again exited for the flyght. Cat watches Karsy as she flies around. It was beautiful the way she moved through the sky. The only thing she wanted t do was get up and fly. Instead, she kept chewing on her bone. She trotted over to the carcass and ripped off the biggest chunk she could. "I'll bring this to Blake and the pup." She called out. "It should be enough right? Pups don't eat that much." She didn't wait for n answer and runs to the den. Karsy watched as Cat runned to the den. "Ok Cat, well all have to end the tour let's go to the river" she said leading the group to the river".After she finish the tour will rest and then try again flying. Pheonix stopped eating as he noticed Karsy walking away. The male raced to Karsy, and began following behind her. The tour is pretty fun. He grinned and continued following Karsy. Bolt arrived at the place. His scent was hidden, this learned from his dad. Bolt set dawn waiting the sky to turn dark then he will strike. He closed eyes and sniffed the air felling scents of elk herds around. This night he will hunt bull elk more meat for the pack. The male can't fail, the pack waits and this is his job. The sky was dark "Perfect" whispered to self Bolt. He slowly padded to the elk herds smell. His blue eyes were perfect for night hunt. He followed the bull elks scents to chose the weakesst one. One of them was far away from other herds. Bolt stalked near the weak bull elk, and jumped in attack to it's neck. The male bit the elk's neck hard while the bull elk was hiting and pushing him. Bolt locked his jaws in a furious bite and digged fangs deep into the elks flesh. But the elk didn't gave up, it was rolling his head round and round trying to get of the wolf. After half hour the elk got tired and felt dawn almost giving up the batle. The black wolf bit it's neck more and more and at last snapped the elks neck living it dead. Bolt opened jaws with hurt he used alot of power in the jaws. He pushed the elk carcass to be sure that was dead. It was dead at last. And started pulling the elk to the river, again using his jaws. Bolt was getting tired after all this, but doesn't give up easy he will feed the pack no matter what. Cat arrives at the hunting grounds first. She waited for the rest of her group to arrive.